DIGITAL DOWNLOAD ALSO AVAILABLE (EMAIL US AFTER ORDERING). ALL INTERNATIONAL ORDERS ARE DOWNLOAD ONLY. Sign up today to receive the latest ChromaPure news. Most US orders ship USPS Priority Mail and international orders ship USPS Express Mail. International orders may include extra import duties and/or taxes according to the laws of the target country. Contact us for custom shipping. Test patterns are an essential element of any display calibration. 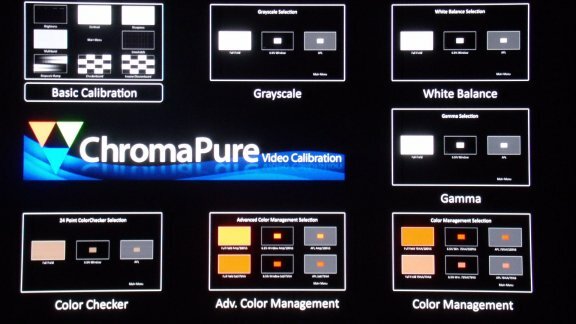 ChromaPure includes some basic patterns that can be displayed through the PC's video card, but for a full suite of test patterns you need another source. Video test pattern generators, such as the Accupel, are probably the best approach, but this is an expensive option outside the reach of most consumers. For most people the best source of video test patterns is on a disc played through a DVD or Blu-ray player. Each of these test patterns are offered in full fields, 6.5% windows, and 6.5% APL windows. 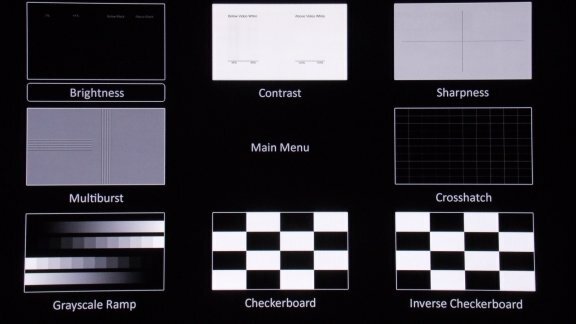 These test patterns are used in our ChromaPure Grayscale & Color Calibration for Dummies guide. The Basic Calibration test patterns on this disc include many extra tips and instructions for use. Simply press the Menu button on you Blu-ray player remote while viewing these test patterns for extra help. The test patterns on the disc are arranged in a way that is conducive to the normal workflow ChromaPure users would normally experience. Also, particular care was taken to ensure that the disc is simple and easy to use. To navigate between patterns in a series (such as grayscale), just use the chapter forward button on the disc player's remote control. For navigation aids or text-based explanations for how to use some of the patterns, just press the pop-up menu button on the remote. 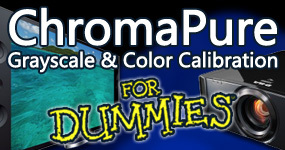 The ChromaPure Calibration Disc is now offered for free along with the purchase of a ChromaPure Display 3 PRO bundle or Display 3 PRO auto-calibrate bundle. Additionally, the disc is available as a standalone purchase. 1920 x 1080 test patterns on a 25GB Blu-ray disc (region free, will work anywhere in the world). How do I get this as a digital download? Downloadable version available upon request (no shipping). Simply purchase the disc and then e-mail us indicating that you'd prefer a download instead. We will provide a link and refund you the shipping charges. You may download the file in either Blu-ray or AVCHD format. Both files are an .iso. To burn to a disc, only the AVCHD and a DVD burner are required. A Blu-ray burner is not required. (The resolution will still be 1920x1080 HD on DVD).